Here is a good example of a poem that I wrote and left alone for a while. 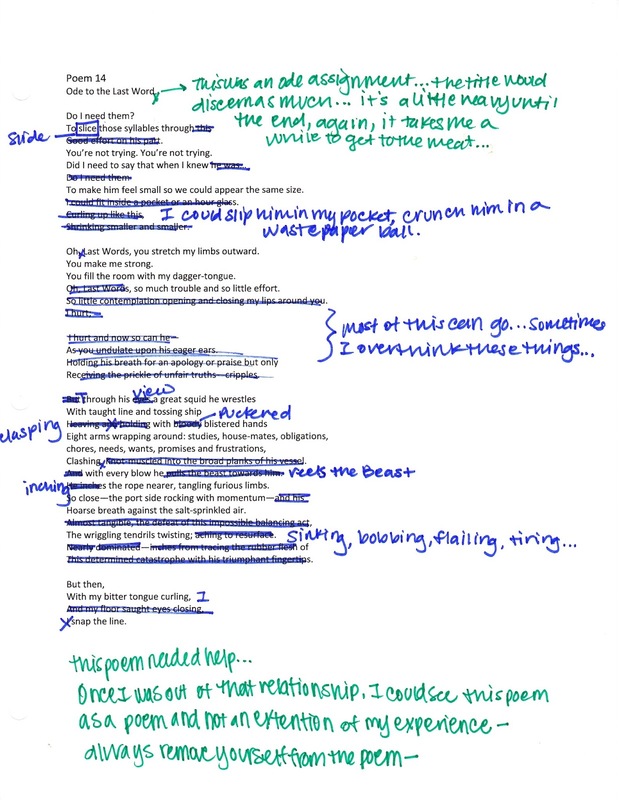 Very little editing has taken place from the origional form and it shows in the need for revision… often the first way a poem shows on paper is not the way I like it… Some writers can write something and walk away, others (like me) need to really tweak the result. You can see on the new poems I’m posting throughout this assignment that the older ones have had a lot more attention. Knowing where you struggle or stride as a writer is half the battle, honestly, the whole world writes or thinks or learns differently. Knowing your own style is the most effective way to succeed. So here we go, an ode. For this poem, the lines are a little choppy. As with much of my work, the real meat comes at the end, when I’ve sorted through all of the issues. There isn’t much to keep from the opening paragraphs… the lines are filler while I tried to work through what the prompt was asking me to achieve. For this one, the imagery of the beast, though a little cliche, creats a stronger point of interest than vague personal trepidations. My issue, pretty consistently, is needing to write down that crap to get to the Truth behind my personal truth. In class we would try and sort out this notion of Truth and truth, the capital being some shade of universal truth while the lower case was a measure of personal understanding, rooted in perspective and often moot in the wake of existential collectivism…. big words for the big T being more important than the little t… until of course we consider Whitman and other confessionalist poets who took that Truth and prought it to ground level truth, without losing any potency. It’s a lot to think about… I could go on for hours, really. As a writer, we are more concerned with putting out the best possible content. There should ge a good presence of truth, but remember to give that Truth a center stage if you want a poem to matter. For example, in this poem, me feeling small and irrelevant is important, but not as important as watching a friend wrestle with responsibility and fail. No one cares all that much about poor little me (which occupies the first 3rd of the poem) but that daily struggle is universal. Knowing the difference between Truth and truth is a lifelong struggle. The important thing to remember about writing and editing is to reach a balance between the trivial and the universal. Don’t let the poem be so much about the mememememe unless there is Truth in that… and don’t come in swinging a battering ram of Truth without taking it back down to ground level truth. Balance is key. It there’s something missing, add it; if there’s too much, take it out. It’s that simple… that’s why we edit. And remember to always give a poem time… the Truth and truth will separate like milk and foam in the fridge right after steaming (there’s some barista knowledge for ya! ).